Despite Mattel's limited addition Mad Men Barbie collection being long since sold out, photographer Michael Williams, who specializes in doll photography, has parodied the women of Season 5 with Barbies. 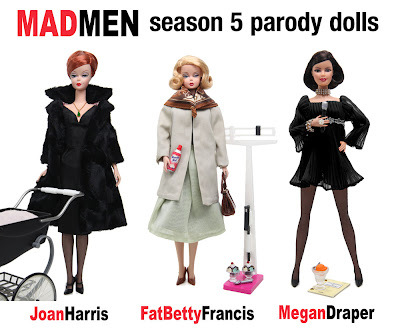 From Fat Betty Draper with Reddi-Wip in hand to Little Sally Draper with a bottle of Seconal sleeping pills, each doll comes with the appropriate would be accessories. I'm left wondering, are there really photographers who specialize in doll photography? An added note to David P.
Yep...just pick up a copy of FDQ magazine! FDQ dolls - they're not your mother's Barbies.